I went to the Wolf Creek Environmental Center of the Medina Park System seeking the Green Heron. I have only ever seen Green Herons about five times and got some good photos of one at this location previously. No such luck. The only large birds in evidence were three Canada Geese. Looking around, I started playing with the lighting effects produced by the bright morning sun on the almost-smooth surface of the wildlife area’s big pond. 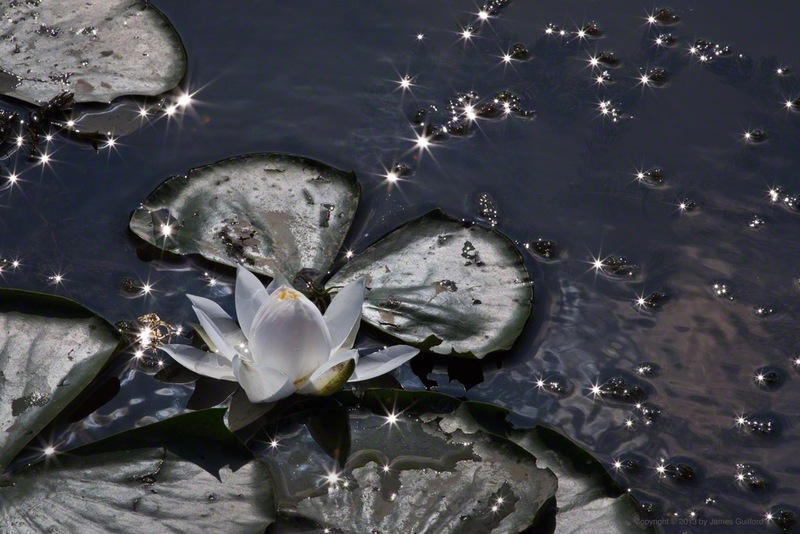 In the shot above, the direct reflection of the sun is directly behind the blooming water lily. As I watched through the camera viewfinder, sparkles came and went as tiny waves touched bubbles and lily pads — it was amazing to see! The stars we see here were formed by the blades of the diaphragm inside the stopped-down lens, not by a filter. I may not have seen a Green Heron Friday but I did see stars on the water!